Biomedical materials should have biodegradability (enzymatic degradation and hydrolysis) because biodegradable materials in clinical applications show excellent biocompatibility. Polycaprolactone (PCL) is a type of semicrystalline polymer that can be utilized in various organic solvents. Therefore, PCL was made as controlled-release drug carriers for long-term treatment. 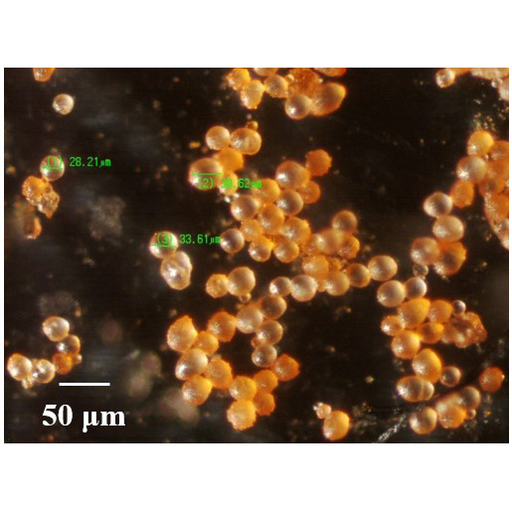 In this study, we propose a method of preparing biodegradable PCL microcarriers with a uniform and controllable particle size (size range, ~5–100 µm) by emulsion-solvent evaporation with ultrasonic microdroplet spray technology. The emulsion-solvent evaporation was assisted by the ultrasonic spray. Through the standing wave effect on the ultrasonic nozzle, the continuous oil solution of PCL became discontinuous, and the microdroplets of the oil solution were sprayed out directly with high-uniformity particle size. Furthermore, the oil microdroplets of PCL were collected by an aqueous stream in the emulsion process to form the emulsion type of oil in water (O/W). In addition, the ultrasonic-assisted emulsification technology was adjusted by stirring to enhance the uniformity of particle size. As a result, PCL microdroplets were sprayed into an aqueous solution owing to the low surface tension between the oil and the aqueous solution and the vertical flow field generated by the stirring equipment. The yield rate of PCL microcarriers was improved effectively. Moreover, microcarriers loaded with the cancer drug doxorubicin (DOX), which is water-soluble, were fabricated uniformly with ultrasonic-assisted emulsification technology. The drug loading efficiency (DLE) in this work was ~42.2%, and a microcarrier encapsulation efficiency (EE) of 3.21% was obtained with a particle size of around 5−20 µm. Yeong-Maw Hwang, Cheng-Tang Pan, Yu-Min Lin, Song-Wei Zeng, Chung-Kun Yen, Shao-Yu Wang, Shiao-Wei Kuo, Shin-Pon Ju, Shih-Shin Liang, and Zong-Hsin Liu, Preparation of Biodegradable Polycaprolactone Microcarriers with Doxorubicin Hydrochloride by Ultrasonic-assisted Emulsification Technology, Sens. Mater., Vol. 31, No. 2, 2019, p. 301-310.